In 1939, attending Yale University, Edward is invited to join Skull and Bones. In his initiation, he reveals that he discovered but never read the suicide note left by his father (Timothy Hutton), an admiral who was to be named Secretary of the Navy until his loyalties were questioned. FBI agent Sam Murach (Alec Baldwin) recruits Edward to expose professor Dr. Fredericks (Michael Gambon) as a Nazi spy, leading to Fredericks' resignation. Edward dates a deaf student named Laura (Tammy Blanchard), but is seduced by Margaret “Clover” Russell (Angelina Jolie). General Bill Sullivan (Robert De Niro) offers Edward a post in London with the OSS. Clover's brother John (Gabriel Macht) tells Edward she is pregnant with Edward's child; Laura, reading their lips, leaves. Edward marries Clover and accepts Sullivan’s offer, leaving his new wife for London where he finds Dr. Fredericks, actually a British intelligence operative who recommended Edward for counter-espionage training. Special Operations Executive officer Arch Cummings (Billy Crudup) tells Edward that Fredericks' indiscreet liaisons pose a security risk; Fredericks refuses to retire quietly and is killed. In post-war Berlin, Edward collaborates with Soviet counterpart "Ulysses" (Oleg Stefan). Learning Clover is having an affair, Edward sleeps with his interpreter Hanna Schiller (Martina Gedeck); he realizes she is a Soviet operative and she is killed. After six years, Edward returns home to a distant Clover, preferring to be called Margaret, and helps Sullivan form the CIA with colleague Richard Hayes (Lee Pace) under Phillip Allen (William Hurt). Monitoring Soviet activity in Central America, Edward recognizes Ulysses, who sends him an agent’s severed finger. Valentin Mironov (John Sessions) convinces Edward he is a high-ranking KGB defector. Edward encounters Laura and rekindles their romance, until Margaret confronts him with compromising photographs, and he ends the affair. Another Soviet defector claims he is the real Mironov and the imposter is a double-agent. Tortured and administered liquid LSD, he ridicules his interrogators before hurling himself out a window. The first defector, watching with Edward, offers to take LSD to prove his innocence, but Edward declines. At Yale, his son Edward Jr. also joins Skull and Bones and is approached by the CIA. Despite Margaret’s pleas, Edward Jr. joins the agency. When he overhears Edward and Hayes discuss the upcoming Bay of Pigs invasion, Edward warns him to remain silent. Margaret moves out. In 1961, the tape recording leads CIA specialists to deduce the photograph may have been taken in Léopoldville. There, Edward realizes the photograph and tape are of his son. He meets Ulysses, who plays the unedited tape of Edward Jr. repeating the conversation he overheard to his lover Miriam (Liya Kebede), a Soviet spy, unknowingly leaking the upcoming invasion. Encouraged to spy for the Soviets in exchange for his son’s protection, Edward confronts his son, who refuses to believe Miriam is a spy. Edward exposes Mironov as a double-agent and Cummings as a co-conspirator, who flees to Moscow. Ulysses’ aide is revealed to be “Cardinal,” Edward's mole. Edward and Margaret arrive separately in the Congo for Edward Jr.'s wedding to Miriam; flying to the ceremony, Miriam is thrown out of a plane. Edward informs his son of her death and denies responsibility, but is shaken to learn she was pregnant. Edward meets Hayes at the new CIA headquarters, noting the lobby’s Biblical inscription: "And ye shall know the truth, and the truth shall make you free (John 8:32)." Allen is resigning in disgrace, and the President has named Hayes the new Director of the CIA, and appoints Edward the first head of counter-intelligence. Edward finally reads his father’s suicide note, learning that he had betrayed his country but urged his son to live a life of decency and truth. Edward sadly burns the note, and leaves his old office for his new wing in the CIA. Joe Pesci as Joseph Palmi; based partly on Sam Giancana and Santo Trafficante Jr.
Billy Crudup as Archibald "Arch" Cummings; based on Kim Philby, and named for E.E. Cummings, a real life confidant of Angleton. Timothy Hutton as Admiral Thomas Wilson, based on James Forrestal. John Sessions as Valentin Mironov #1/Yuri Modin; based on Anatoliy Golitsyn, and on Yuri Modin, the 'legman' KGB operative controlling the 'Cambridge Five'. Keir Dullea as Senator John Russell, Sr.
Gabriel Macht as John Russell, Jr.
Eddie Redmayne as older Edward Wilson, Jr. The Good Shepherd marked Joe Pesci's return to acting after an eight-year absence from the screen following Lethal Weapon 4. After The Good Shepherd, Joe Pesci went on another hiatus from acting for four years. De Niro personally produced the film together with James G. Robinson and Jane Rosenthal. Eric Roth, the film's screenwriter, began to work on the project after he abandoned his attempt to bring Norman Mailer's Harlot's Ghost to the screen. Like De Niro's film, Mailer's novel is a fictionalized chronicle of the CIA. Eric Roth wrote the screenplay in 1994 for Francis Ford Coppola and Columbia Pictures. Roth read Norman Mailer's Harlot's Ghost and became intrigued with the people who built the CIA. Coppola left the project because he could not relate to the characters due to their lack of emotion (although he retained a credit as co-executive producer). Wayne Wang was set to direct and even conducted some location scouting but management changes at Columbia ended his involvement. The new administration gave Roth a list of directors to choose from and one of them was Philip Kaufman. Kaufman felt that Roth's script, whose original structure was linear, should go back and forth in time to "give it a more contemporary feeling". Kaufman and Roth worked on the project for a year and then the management changed at the studio again. The new studio head had no interest in spy films unless they could get a star like Tom Cruise to appear in the film. The project languished until John Frankenheimer signed on to make the film with MGM agreeing to purchase the rights. He wanted Robert De Niro to star, having just worked together on Ronin. De Niro had been developing his own spy story about the CIA from the Bay of Pigs Invasion to the fall of the Berlin Wall in 1989 and agreed to appear in the film. During pre-production in 2002, Frankenheimer died. According to producer Jane Rosenthal, this had been Robert De Niro's pet project for nine years, but it proved difficult to produce in a pre-9/11 world and had to compete with his busy schedule as an actor. The actor said in an interview, "I had always been interested in the Cold War. I was raised in the Cold War. All of the intelligence stuff was interesting to me". De Niro and Roth ended up making a deal: Roth would write up De Niro's idea into a screenplay if the actor would direct his existing script. 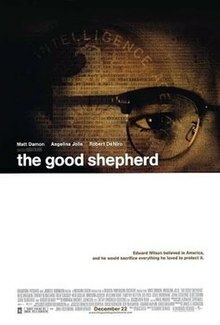 If The Good Shepherd proved to be a commercial success then their follow-up would be De Niro's pitch. De Niro took the project to Universal Pictures where producer Graham King agreed to help finance the $110+ million budget. He had a deal with Leonardo DiCaprio, who was interested in playing the film's protagonist Edward Wilson. De Niro planned to film in early 2005 but DiCaprio could not do it then because he was making The Departed for Martin Scorsese. At this point, King left the project, as did his backers. De Niro approached Matt Damon, who was also doing The Departed but would be done earlier than DiCaprio and De Niro would only have to wait six months to do the film with him. Initially, Damon turned De Niro down because he was scheduled to shoot Steven Soderbergh's The Informant!. Soderbergh agreed to delay filming and Damon agreed to star as Wilson. James Robinson's Morgan Creek Productions agreed to help finance the film with a budget under $90 million which meant that many of the principal actors, Damon included, would have to waive their usual salaries to keep costs down. De Niro was not interested in making a spy movie with flashy violence and exciting car chases. "I just like it when things happen for a reason. So I want to downplay the violence, depict it in a muted way. In those days, it was a gentleman's game". He and Roth were also interested in showing how absolute power corrupted the leaders of the CIA. Early on, De Niro said in an interview, "they tried to do what they thought was right. And then, as they went on, they became overconfident and started doing things that are not always in our best interests". In preparation for the film, De Niro watched spy films like The Spy Who Came In From the Cold, The Third Man, and the Smiley's People miniseries. He also hired retired CIA agent Milton Bearden to serve as a technical adviser on the film. They had first worked together on Meet the Parents where De Niro played a retired CIA agent. Bearden agreed to take De Niro through Afghanistan to the north-west frontier of Pakistan and into Moscow for a guided tour of intelligence gathering. Damon also spent time with Bearden as well as visiting several of the locations depicted in the film and reading several books on the CIA. Bearden also made sure that the historical aspects were correct but fictionalized to a certain degree. Principal photography began on August 18, 2005, with shooting taking place in New York City, Washington D.C., London and the Dominican Republic. Three-time Academy Award-nominated art director Jeannine Oppewall was assigned art director for The Good Shepherd, which would eventually earn Oppewall her fourth Oscar nomination for Best Art Design. She conducted a large amount of research for the film that filled ten to twelve 6-inch-thick (150 mm) three-ring binders. It took her a week to organize the number of set locations due to the large amounts of settings in the script, which included Cuba, Léopoldville, London, Guatemala, Moscow, New York City and New Haven, Connecticut, among other places. Although the vast majority of the movie was filmed in New York, the only scenes that are actually set in New York were filmed at the Kirby Hill Estate on Long Island. As a result, many sets had to be constructed under Oppewall's direction, including a Skull and Bones headquarters and the Berlin set, which was built on the Brooklyn Navy Yard. The interiors of the CIA were built in the Brooklyn Armory, a large edifice built in 1901 for the United States Cavalry. She also visited the CIA's headquarters in Washington, D.C. and worked with Bearden to create sets for the CIA's offices, Technical Room and Communications Room. Since the lead character originally aspired to be a poet, Oppewall incorporated many visual poetic symbols into the film, including a large number of mirrors to represent the duplicity of the CIA, full rigged ships as symbols of the state and eagle symbols, which were used in ironic situations such as suspect interrogations. Her team tracked down the right set dressings and also found authentic Teletype machines, reel-to-reel tape recorders and radios used in the CIA during that time. The music for the film was by Bruce Fowler and Marcelo Zarvos. They replaced James Horner, who left the project due to creative differences. The violin solo is an extract from Tchaikovsky's Violin Concerto In D though this is misattributed to Marcelo Zarvos on the soundtrack CD. The Good Shepherd was released on December 22, 2006 in 2,215 theaters, grossing $9.9 million on its opening weekend. It went on to make $59.9 million in North America and $39.5 million in the rest of the world for a worldwide total of $99.4 million. The film received mixed reviews. Review aggregation website Rotten Tomatoes reports a score of 53% based on 89 positive reviews out of 167. Metacritic has a score of 61/100 based on 33 reviews, indicating "Generally favorable reviews". In her review for The New York Times, Manohla Dargis wrote, "The Good Shepherd is an original story about the C.I.A., and for the filmmakers that story boils down to fathers who fail their sons, a suspect metaphor that here becomes all too ploddingly literal", but praised De Niro's direction: "Among the film's most striking visual tropes is the image of Wilson simply going to work in the capital alongside other similarly dressed men, a spectral army clutching briefcases and silently marching to uncertain victory". Kenneth Turan, in his review for the Los Angeles Times, praised Matt Damon's performance: "Damon, in his second major role of the year (after The Departed) once again demonstrates his ability to convey emotional reserves, to animate a character from the inside out and create a man we can sense has more of an interior life than he is willing to let on". Time magazine's Richard Corliss also gave Damon a positive notice in his review: "Damon is terrific in the role-all-knowing, never overtly expressing a feeling. Indeed, so is everyone else in this intricate, understated but ultimately devastating account of how secrets, when they are left to fester, can become an illness, dangerous to those who keep them, more so to nations that base their policies on them". In his review for The New York Observer, Andrew Sarris wrote, "Still, no previous American film has ventured into this still largely unknown territory with such authority and emotional detachment. For this reason alone, The Good Shepherd is must-see viewing". USA Today gave the film three out of four stars and wrote, "What makes the story work so powerfully is his focus on a multidimensional individual—Wilson—thereby creating a stirring personal tale about the inner workings of the clandestine government agency". Entertainment Weekly gave the film a "B" rating and Lisa Schwarzbaum praised De Niro's direction and Damon's performance, noting the latter's maturation as an actor. Newsweek magazine's David Ansen wrote, "For the film's mesmerizing first 50 minutes I thought De Niro might pull off the Godfather of spy movies ... Still, even if the movie's vast reach exceeds its grasp, it's a spellbinding history lesson". However, Peter Travers of Rolling Stone magazine opined, "It's tough to slog through a movie that has no pulse". In his review for the Chicago Sun-Times, Jim Emerson wrote, "If you think George Tenet's Central Intelligence Agency was a disaster, wait until you see Robert De Niro's torpid, ineffectual movie about the history of the agency". Peter Bradshaw in The Guardian gave the film two out of five stars and criticized Damon's performance: "And why is Damon allowed to act in such a callow, boring way? As ever, he looks like he is playing Robin to some imaginary Batman at his side, like Jimmy Stewart and his invisible rabbit. His nasal, unobtrusive voice makes every line sound the same". In 2007, the cast of The Good Shepherd won the Silver Bear of the Berlin International Film Festival for outstanding artistic contribution. It was the only American entry in 2007 to win a prize at the festival. It was also nominated at the 79th Academy Awards in the category of Best Art Direction (Jeannine Oppewall, Gretchen Rau and Leslie E. Rollins). A film can take a strictly documentary approach .. If that's the standard, then anyone with historical sense is going to dislike the liberties The Good Shepherd takes. If one approaches the film as a work of art, one must still ask if there is truth in the story-telling. Does it convey the sense of the time: the atmosphere, the motivations, the tone, and the challenges? I think we all agree that the film fails that test as well. It fails because it inserts themes we know from our studies of the period were not there: the overarching economic interest, the WASP mafia dominance, the cynicism, the dark perspective. In reality, the stakes were high during the Cold War; the Soviets were seen to be on the march and very dangerous. It was serious business, and there were many personal costs. And yet, most CIA people were enjoying their work at the same time, as any number of oral history interviews and memoirs will attest. The same article also describes the depiction of Yale's famous secret society Skull and Bones as being an incubator of the U.S. Intelligence Community as inaccurate. One of the great travesties of the Cold War surfaced on April 29, 2000 when the Washington Post reported the declassification in full of General Maxwell Taylor's June, 1961 special report on the Bay of Pigs invasion. Partial versions of this document have been available for decades. But only now did its darkest secret spill. Here is what Taylor reported to Kennedy. The Russians knew the date of the invasion (Therefore, Castro also knew.) The CIA, headed by Allen Dulles, knew that the Russians knew (Therefore, they knew the invasion would fail). The leak did not come from the invasion force; it had happened before the Cuban exiles were themselves briefed on the date. Kennedy was not informed. Nor, of course, were the exiles. And knowing all this, Dulles ordered the operation forward. Even if the operation had initially succeeded, the idea that this paramilitary battalion would have melted into the jungles and mountains to spawn a general uprising against Castro is fatuous. CIA's own analysts judged that Castro's popular support was strong and that he controlled the army and the security services. Even if the group had secured the beachhead, its members eventually would have been hunted down. The supposed leak had nothing to do with historical reality. De Niro said he would like to make two sequels to The Good Shepherd, one bringing the action forward from 1961 to 1989 and the fall of the Berlin Wall, the other following its protagonist, Edward Wilson, up to the present day. In September 2012, it was announced that Showtime is developing the sequel as a television series, with Eric Roth as executive producer/writer and Robert De Niro directing the pilot. ^ a b c d e f g h Horn, John (November 5, 2006). "Intelligence Design". Los Angeles Times. Retrieved 2007-04-06. ^ dhingrammd (22 December 2006). "The Good Shepherd (2006)". IMDb. ^ a b "The Good Shepherd". Box Office Mojo. Retrieved 2009-04-06. ^ a b c d e f Robarge, David; Gary McCollim; Nicholas Dujmovic; Thomas G. Coffey (January 8, 2007). "The Good Shepherd: Intelligence in Recent Public Media". Central Intelligence Agency. Retrieved 2009-06-17. ^ "Joe Pesci". The Numbers. ^ a b c d Stewart, Ryan (December 11, 2006). "Junket Report: The Good Shepherd". Cinematical. Retrieved 2009-09-16. ^ Hart, Hugh (December 31, 2006). "Soup o the CIA". San Francisco Chronicle. Retrieved 2009-09-16. ^ a b Crowdus, Gary (June 22, 2007). "Living in a wilderness of mirrors: an interview with Eric Roth". Cineaste. ^ Thomson, David (June 22, 2007). "Spies Like Us". The Guardian. Retrieved 2009-09-16. ^ a b c d "The Good Shepherd Production Notes". Universal Pictures. 2006. ^ "The Good Shepherd (2006)". Rotten Tomatoes. Flixster. ^ "The Good Shepherd Reviews - Metacritic". ^ Dargis, Manohla (December 22, 2006). "Company Man: Hush, Hush, Sweet Operative". The New York Times. Retrieved 2009-04-06. ^ Turan, Kenneth (December 22, 2006). "The Good Shepherd". The Los Angeles Times. Retrieved 2009-04-06. ^ Corliss, Richard (December 10, 2006). "Holiday Movies". Time. Retrieved 2009-04-06. ^ Sarris, Andrew (January 7, 2007). "Shhhh! De Niro's Spy Flick Keeps It to a Whisper". The New York Observer. Retrieved 2009-04-06. ^ Puig, Claudia (December 22, 2006). "Mesmerizing Good Shepherd will rope you in". USA Today. Retrieved 2009-04-06. ^ Schwarzbaum, Lisa (December 13, 2006). "The Good Shepherd". Entertainment Weekly. Retrieved 2009-04-06. ^ Ansen, David (January 29, 2007). "Following the Flock". Newsweek. Retrieved 2009-04-06. ^ Travers, Peter (December 12, 2006). "The Good Shepherd". Rolling Stone. Retrieved 2009-04-06. ^ Emerson, Jim (December 22, 2006). "The Good Shepherd". Chicago Sun-Times. Retrieved 2009-04-06. ^ Bradshaw, Peter (February 23, 2007). "The Good Shepherd". The Guardian. Retrieved 2009-04-06. ^ Meza, Ed (February 17, 2007). "Tuya nabs top prize at Berlin fest". Variety. Retrieved 2007-04-06. ^ "The 79th Academy Awards (2007) Nominees and Winners". Academy of Motion Picture Arts and Sciences. AMPAS. Retrieved April 19, 2014. ^ Aftab, Kaleem (July 25, 2008). "Robert De Niro: "You talkin' to me? Oh, OK, then..."". The Independent. Retrieved 2009-05-29. Galbraith, James K. (2000). "A Crime So Immense" (PDF). Texas Observer, (C) 2000 Texas Democracy Foundation. Archived from the original (PDF) on 2006-09-04.